Few countries can rival Denmark when it comes to revitalising the contemporary recorder repertoire. 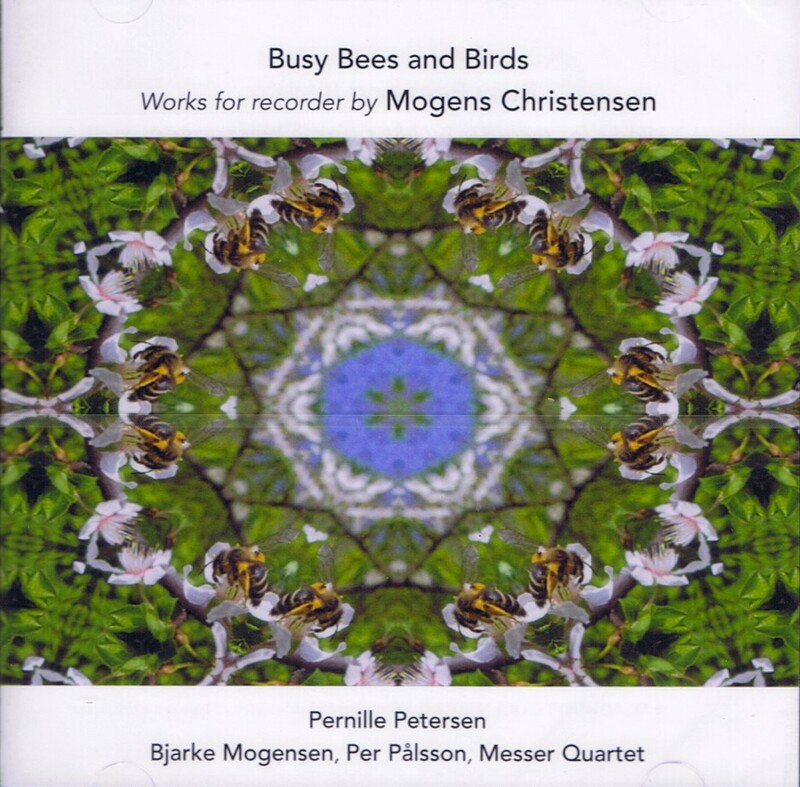 From the current crop of composers Mogens Christensen (b 1955) is among the most significant – as attested by “Busy Bees and Birds”, in which Pernille Petersen is a dedicated exponent. 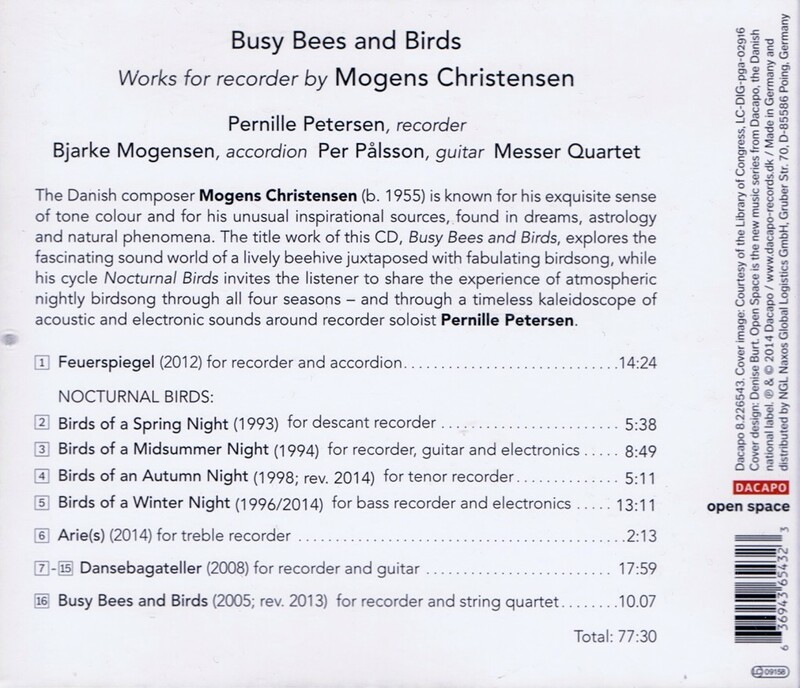 She and the accordionist Bjarke Mogensen find a heady symbiosis in the duo Feuerspiegel, then she conveys an ethereal detachment in the seasonal traversal of Nocturnal Birds. An as a limpid poise the brief yet engaging Arie(s). She is joined by guitarist Per Pålsson for the Dansebagateller that constitutes an unlikely “theme and variations” in which each piece is a variation on its predecessor – climaxing in the mesmeric tour de force of the sixth bagatelle. The final piece also gives this disc its title. Petersen joined here by the Messer Quartet in the compact but eventful “concerto” where the sound of bees mutates into that of birds thanks to a little electronic assistance. It ends an absorbing disc that takes the recorder to new limits. This handsomely produced disc is a showcase for the equally spectacular recorder music of the Danish composer Mogens Christensen … I have no doubt that Mogens Christensen is one of the most exciting and accomplished of modern day writers for the recorder, and it is sad that his music, and not just his recorder output, is not better known in this country. But be warned – it is challenging (but rewarding) to play! Unsurprisingly he is regarded as one of the native country’s foremost composers, having been composer-in-residence with the Copenhagen Philharmonic Orchestra and other ensembles. Naturen har mange lyde, og blokfløjtenisten Pernille Petersen har mange fløjter og et enormt musikalsk overskud. Den kombination er til at tage og høre på i komponisten Mogens Christensens (f. 1955) hypersensitive univers, inspireret af bl.a. fuglefløjt, bikube-summen og drømme. 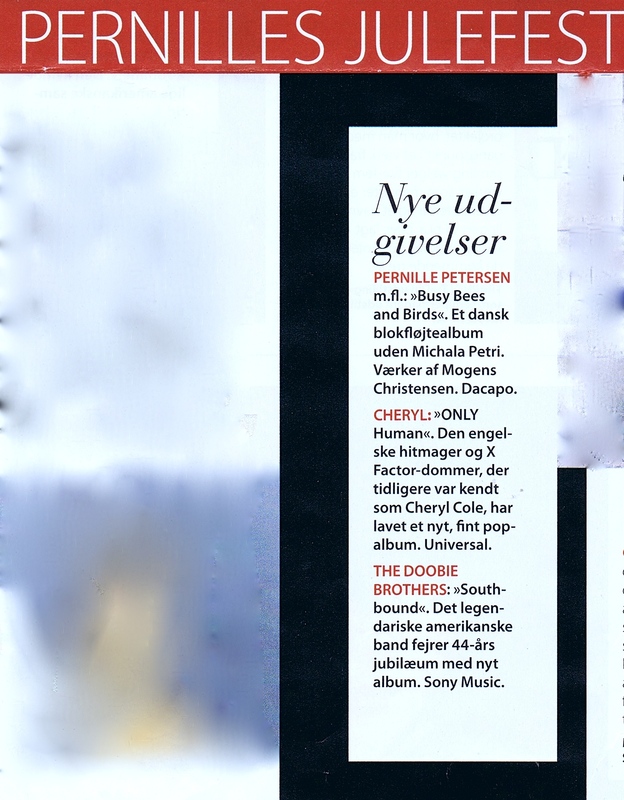 Fuglene giver nattelyde fra sig gennem de fire årstider i “Nocturnal Birds”, med tilsat elektronik og guitarakkompagnement (Per Pålsson). Guitaren ledsager også fløjterne i ni charmerende “Dansebagateller”, som bygger på en jysk folkemelodi. Danmarks eneste strygekvartet på elektriske violiner “Messer Kvartetten” agerer summende bier i blokfløjtekoncerten “Busy Bees and Birds”, mens Pernille Petersen frækt, lyrisk, energisk og ofte imod alle naturlove puster liv i træstykkerne med huller i, bl.a. i “Feuerspiegel”, en næsten kosmisk duet med Bjarke Mogensen, Han får med sin akkordeon de to “luft-bårne” instrumenter til at smelte lydligt næsten helt sammen. Fascinerende.